There has been an ongoing trend over the last decade or so of television reaching for, and often surpassing, the quality of many current films. Networks like HBO and Showtime have consistently offered cutting edge programming and films that often rival their big screen counterparts. So it should come as no surprise, then, that the British miniseries Red Riding was good enough to receive a theatrical release in the United States. Made up of three feature length films by three different directors, Julian Jarrold (Brideshead Revisited), James Marsh (Man on Wire), and Anand Tucker (Shopgirl), Red Riding chronicles police corruption in Yorkshire, England over the course of nearly a decade, covering the crimes of two serial killers and the massive cover ups and case mishandlings that were the result. 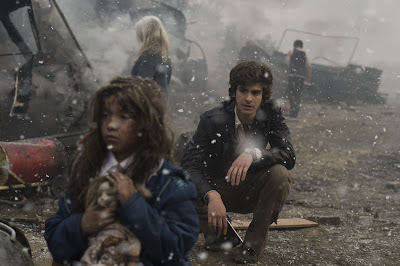 The first film, Red Riding: 1974, sets it all in motion with the story of Eddie Dunford (Andrew Garfield), an intrepid young reporter (is there any other kind?) who becomes fascinated and later obsessed with the case of a young girl who was kidnapped and later found brutally murdered with swan wings stitched into her back to give her the appearance of an angel. Andrew Garfield as Eddie Dunford in RED RIDING 1974 directed by Julian Jarrold. Photo credit: Phil Fisk. An IFC Films release. As Eddie begins making advances and discoveries about the case, police resistance increases. Soon he finds himself the target of police harassment and brutality, which only gets worse the closer he gets to answers, connecting the murder to a string of similar disappearances that begin to point in a surprising and dangerous direction. Of all the films in the Red Riding trilogy, 1974 has the greatest cinematic staying power, encompassing a greater whole and offering a more satisfyingly complete experience. Beautifully directed by Jarrold, 1974 is a haunting and frightening portrait of a man willing to find the answers at all costs that approaches Zodiac in its quality. It paints an extremely grim picture of a lone man against the system, where those who are meant to serve and protect are the very thing to be feared. Garfield makes for a strong and appealing lead, a principled level head in a sea of insanity and evil. Jarrold perfectly captures that sense of unnerving paranoia that no one can be trusted and danger lurks around every corner. It's fascinating, and indeed quite distrurbing, that a film so aesthetically beautiful could contain such breathtaking horrors, and even worse, that such horrors could be true. Paddy Considine as Peter Hunter and Tony Fitts as John Nolan in RED RIDING 1980 directed by James Marsh. By the time we get to Red Riding: 1980, six years have passed and the cases have changed, but some of the faces remain the same. With the case of the missing girl behind them, the Yorkshire police have moved on to the infamous Yorkshire Ripper, who is murdering prostitutes Jack the Ripper style and holding the region in a grip of fear. 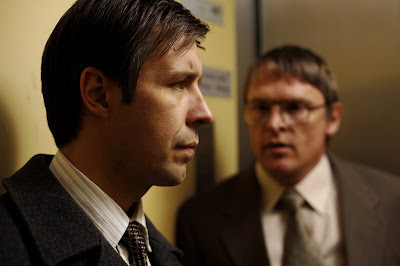 Paddy Considine stars as Peter Hunter, an internal police investigator sent to Yorkshire to try and solve the problem away from the public eye. But like Eddie Dunford before him, he uncovers a web of cover-ups and lies that goes further up the chain than he could have ever imagined, finding police obstruction and dark secrets at every turn. 1980 is connected to its predecessor mostly through minor characters, illustrating just how widespread the corruption was and how deep it went. The film has a more documentary-like feel to it thanks to Man on Wire director James Marsh, who peppers it with newsreel footage giving 1980 a more immediate and gritty feel. It is also the most dense and frustrating of the films, and sandwiched between 1974 and 1983, which connects back to the case of the first film, 1980 sticks out from the pack a bit. It has an interesting and compelling atmosphere, and a stronger sense of human relationships than its counterparts, but it's also much more cold and impenetrable. While it serves to further illustrate the corruption of the Yorkshire police, it doesn't seem to have as much to offer in the grand scheme of the Red Riding arc. The third film in the trilogy, 1983, like its two predecessors, has its own unique atmosphere. Much slicker and more conventional in its structure under the direction of Anand Tucker, 1983 ties up the loose ends left hanging by the previous films and gives us the answers we have been looking for. 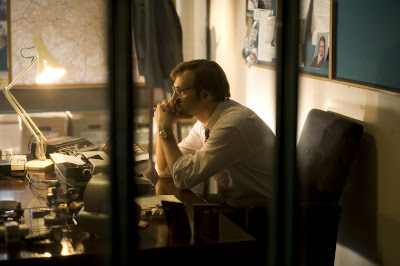 When a little girl goes missing under similar circumstances as the girl who was murdered nine years before in 1974, Maurice Jobson (David Morrissey), a policeman with a conscience realizes what so many are unwilling to admit, that the boy in jail for the crime is not the real criminal. After more than a decade of corrupt police rule, Maurice has had enough, and along with John Piggot (Mark Addy), a lawyer who has been hired by the boy's mother to appeal his case, sets out to try to find the real culprit before the corruption of the Yorkshire police department and their unwillingness to admit they were wrong condemns his latest victim to death. David Morrissey as Maurice Jobson in RED RIDING 1983 directed by Anand Tucker. 1983 is a much more leisurely paced and less intricate film than the other two films in the trilogy, but that's partially due to the fact that it is answering more questions than it is raising. It is beautifully filmed, and is more satisfying in its connection to the first film, providing much needed closure to a series marked by its stubborn refusal to offer any such comforting affectations. But by splitting the main thread between two (and in some ways three) main characters(neither as compelling as the protagonists of 1974 or 1980), it falters a bit. Each film is only around an hour and a half long, so a lot of ground must be covered in very little time, and in 1983, everything must be resolved, and quickly. The final installment is a more complete viewing experience overall than 1980, and it's hard to deny the beauty of its composition, but it never escapes the feeling of being just a bit too tidy. When viewed as part of the narrative arc, however, 1983 is the catharsis it needed to be. Each film of the trilogy has its own strengths and weaknesses. Taken as a whole, Red Riding is an impressive achievement that deserves to be seen together, in order, to really appreciate its full impact. While 1980 falls a bit victim to middle child syndrome, and 1983 lacks the compelling forward motion of the first film, 1974 offers the most complete individual viewing experience. It sums up the very best of what this series is about, and is a great stand-alone film as well, something the other films really can't claim, although that is really out of necessity. Each of the three directors brings something new to the table in their respective films, which adds to the trilogy's consistently surprising and compelling verve. Taken individually, they are solid films, taken together, Red Riding is a major and unforgettable cinematic event. If this is the kind of quality that British television is offering now, then America has a long way to go. 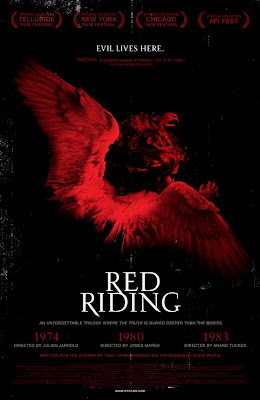 RED RIDING; Directed by Julian Jarrold, James Marsh, Anand Tucker; Stars Andrew Garfield, Paddy Considine, Sean Bean, Mark Addy, David Morrissey; Not Rated; Opens tomorrow, 2/5, in New York. I am DYING to see this in theatres, but I don't know if I'll ever get the chance. Not sure how wide it's going to go. Since it's 3 films I'm sure it will be hard to book and schedule accordingly. I'll wait for dvd. I usually spend the whole day at the theaters no problem, but only if I'm watching completely different movies.